Forever Active Pro-B blends six strains of friendly bacteria, selected and engineered for their ability to reach the intended destination of the large intestine. Forever Active Pro-B is the perfect high-quality friendly bacteria supplement to complement your gut flora and assist with your diet and lifestyle goals. Each strain goes through thorough testing and has been selected for its ability to bypass stomach acid for optimal delivery into the intestines. 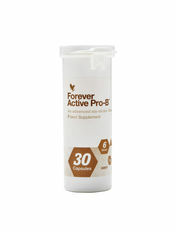 Forever Active Pro-B does not require refrigeration, but to ensure maximum benefits the capsules are stored in unique packaging that controls moisture and protects the goodness captured in each supplement. The formula is also free from allergens and suitable for vegetarians. Take one capsule daily with water 30 minutes before a meal. Do not use if packaging is damaged. Store tightly closed in a cool, dry place. Hydrolysed corn dextrin, fructooligosaccharides, glazing agent (hydroxypropyl methylcellulose), Bifidobacterium lactis, Lactobacillus rhamnosus, Lactobacillus reuteri, Lactobacillus acidophilus, anti-caking agent (magnesium stearate, silicon dioxide) Bifidobacterium longum, Bifidobacterium bifidum, colour (titanium dioxide).